I usually describe our homeschool as “Classical/Charlotte-Mason-y” but frankly we’re a bit simpler than either of these. After 13 years, our school is a mix of philosophies, honed and simplified down to what works for me and for my children. Someday I will write about those influences, but the overarching goal is what some call “schole:” real but relaxed learning. 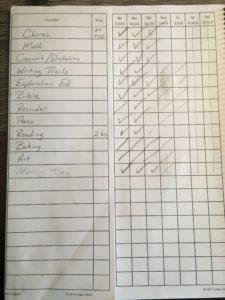 This post is about what a typical day looks like with grades 12, 6, 3, and K.
We follow a routine, or a rhythm, rather than a schedule. This gives me a good balance of structure and flexibility. A tight schedule makes me feel suffocated, but things go smoother when the flow of our days is pretty similar from day to day. 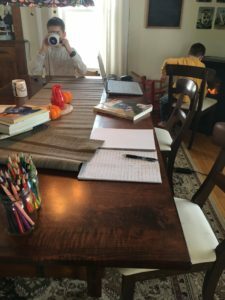 Morning: We are not early risers here and so our mornings may not look typical for a homeschool family. The average waking time is probably around 8am. The children know they are to be dressed, breakfasted, and have chores done by 9:30. Breakfast is simple and chores are short, to keep the mornings from getting too chaotic. I need a quiet start to my day, so I shower, have coffee, and hopefully read a little Bible while the kids are getting ready. Getting to this point of self-starting mornings took a few years of training and assistance, I’ll be honest! And even now, my mornings are not as idyllic as they sound here; I am often jumping up to settle a squabble, or get the lumps out of the Coco-Wheats. One key to a prompt morning for me is NOT opening my computer until the morning push for school is done. I may check my phone briefly for things like texts or weather but I have deleted all potentially time-sucking apps. Start of School, roughly 9:30am: The three older children have student planners so they always know what is on the docket for the schoolday. They can begin their day without me if I’m not ready. Many days they may start some math or reading until I am able to sit down with them. We usually have Morning Time (read-aloud time) as soon as I’m ready; it is the priority of the day. Our high-schooler is not part of this; he has community college classes in the mornings, then works independently in the afternoons. Morning Time: We start with a hymn (Hymns for a Kid’s Heart), playing the audio and singing or following along. I’ve found the louder you crank it up, the more likely the children will sing along. We do one hymn a week. When we finish the hymn book (we’re doing the Passion volume currently), we will start another book/audio of either classical or folk songs. Then I read a passage of Scripture for memory work. Currently it is Psalm 1. I will read the same passage for a month or two, depending on how long it is. Poetry is next. Right now we are using IEW’s Linguistic Development Through Poetry Memorization so there is an audio we play which the children enjoy. We focus on one poem a week. Next is a Bible story from Egermeier’s. It takes about two years to read through this hefty tome. I like it because it is thorough, well-written, accurate, and does not contain much additional moralizing or commentary. Lastly is a chapter or two of quality children’s literature. Right now we are reading King of the Wind. I like to keep a globe and atlas nearby to locate the various settings in our stories. I may ask for an oral narration. Morning Time lasts between 30-45 minutes. Late Morning: After Morning Time, I stay around for another 30-45 minutes. 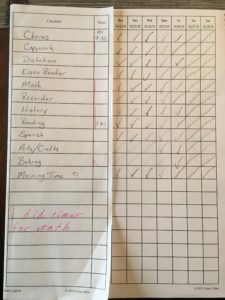 I do a recorder lesson with the children, help them separately with their copywork and dictation, do a math lesson with the 3rd-grader, and also listen to her read aloud from her Elson Reader. When the 6th-grader is done with his math, I correct it with him. At this point, I am done for the day with the older two. They have more school, but it is independent. I am free to read to my kindergartner, or begin lunch prep if it is time for that. Lunch: Our lunch break goes roughly from 12:00-1:30. We live in a cold climate where it is chilly and days are short for much of the schoolyear, so I’ve found it vital for the kids to get a good chunk of outdoor time in the middle of the day. While they are outside, I will feed myself and The Man (who works from home), then load and set the dishwasher for the first run of the day. I can check the state of the laundry and also see what is happening in the world. Afternoon: The children work on completing what is in their planners. The amount really depends on how diligent they were in the morning. The bulk of the remaining schooltime is independent reading; some is assigned, some is free. This is the relaxing part of the day; the time for candles and tea. This is where I diverge a bit from Charlotte Mason. Rather than having a long list of subjects for the children to work through, we have a long period of quiet reading. No narrating, no assignments. My 6th-grader usually does his written narration (from Writing Trails) in the afternoons, and if the children are working on Spanish (a video-based program), it typically gets done now as well. While the elementaries are doing their afternoon work, I do “Kindergarten” with Jack. He is pretty good at playing by himself in the mornings, but it wasn’t always that way! He gets a miniature “Morning Time” which consists of a Bible story from a book more geared for youngers, and a Psalm. Then we do his monthly poem from the Wee Folk Art program as well as the assigned books for the week. We did some phonics for the first few weeks of school, but then he hit a wall so we have put it away for a later time. His schooltime lasts less than 30 minutes. We do no seatwork at this age, but there may be a simple recipe or craft from the Wee Folk Art. Once I’m done with Jack, I get quiet free time to myself! This is crucial recharge time for an introvert mom. Late Afternoon: Free time for the kids. I encourage them to go outside whenever possible. If I have errands to run, I will be gone during this time. It is also when I start thinking about supper. An Instant Pot has been a big help with my short-notice cooking. I loved my crockpot, but rarely got it going in time. After Supper: If we are home for the evening, this is prime time with Dad. We generally do not use this time for “school” but can be for play, projects, chess, or even a movie during the long winter evenings. Bedtime: Is 9-ish for all three youngers during the school year. Around 8:00 we announce the “clean sweep” when the house gets picked up. Then they shower, and gather in the living room for the bedtime read-aloud. Sometimes we will have a dessert, snack, or cinnamon milk at this time. Sometimes The Man will read a devotion as well. When we’re really at the top of our game, there will be singing with the guitar. Then the kids head up and they can read until The Man comes to tuck them in. The high-schooler follows an hour later. Though it does not happen every night, this bedtime ritual has been a huge benefit to our family culture. Our high-schooler also joins us when he is home. He sometimes grumbles but enjoys the stories in spite of himself. After the kids are in bed, The Man and I have a quiet, (somewhat) clean house to ourselves. Where most people may plan and connect early in the mornings before the kids are awake, we do this late at night being the night owls we are. I felt guilt about this for many years, but then realized one day that we had a groove that worked for us. Then before I head to bed I try to make sure the dishwasher is loaded and set to run. Fridays: When my oldest was in the early grades, I found that I rarely got to art and handcrafts, which I really wanted to include in our curriculum. Experienced moms suggested setting aside one day of the week to prioritize the arts, and so Friday has become Art and Baking Day at our house. We still do math, dictation, and reading, but all other academics are set aside to make room for baking projects (of which bread is always one), and art and handcrafts. They may happen on other days too, but once a week they are required. Thursdays: We have a lovely homeschool choir, handbell, and art group in our area that meets on Thursdays for part of the schoolyear. We consider this a wonderful opportunity, and adjust our schedule accordingly. With the drive, we are gone from 8:30am-1pm. On choir Thursdays, we just hit the big three: math, dictation, and reading. *being prepared. I have collected a sizable, quality library over the years that we draw from regularly. 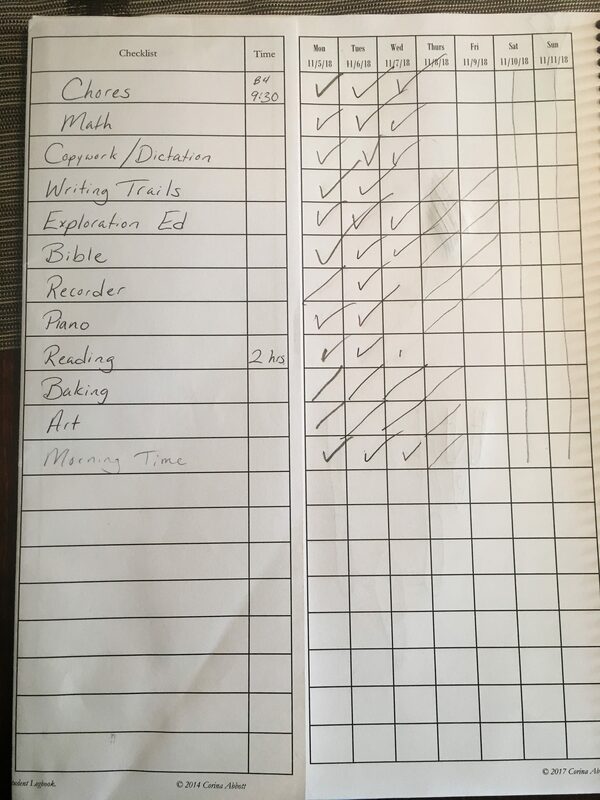 Also I think the Student Planners are a huge factor in our homeschool peace. *knowing what our personal goals are for our family and the flipside, not worrying about what other kids/schools are doing. We do not do any testing until the students are ready to practice for the college boards. There is a certain amount of trust in the philosophy required here. *having children that have grown out of the intense years. Seriously! Days do not flow smoothly when you have babies, toddlers, and preschoolers around. Our mornings used to be much more erratic. Do not be hard on yourself if this is the season of life you find yourself in. Work on getting those little ones into a daily rhythm. Hit the basics with your students (the 3R’s) and be happy with that. As I mentioned at the beginning, it has taken several years to develop our routine and also my confidence! 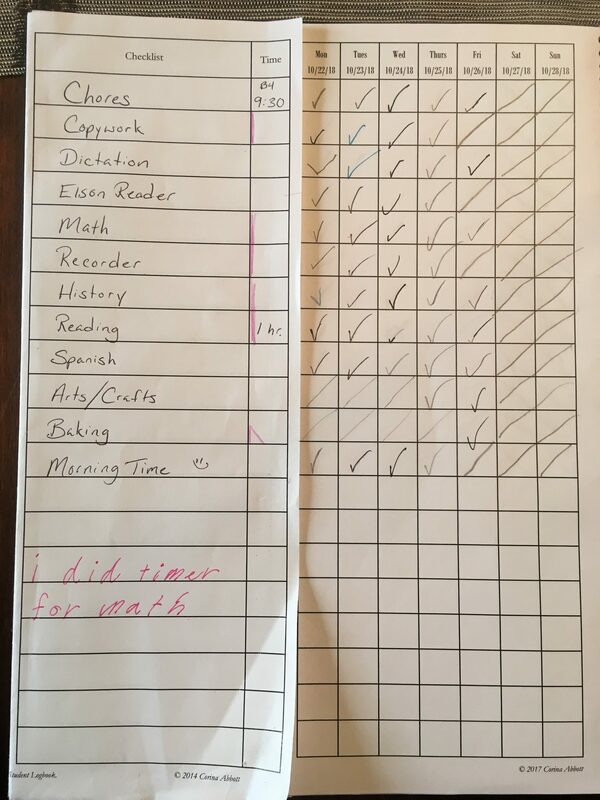 My poor firstborn was quite the guinea pig as we experimented with different curricula and ideas. But those early years of research and experimenting have borne good fruit which my youngers are benefiting from. Don’t be afraid to try some out-of-the-box ideas for your own family. Most importantly, find what works for you, The Mom. We all have different styles and the best curriculum is the one that gets done.